1- Yemen, because of the wealth and strategic location that Allah blessed it with, and above all because its people are Muslims, like the rest of the Muslim countries, the Anglo-American conflict there is strong and fierce to control it, and this conflict is what brought disasters to the people of this country. 2- The former regime led by the late Ali Salih and his party and the parties that participated with him in the government, whether those who call themselves Islamic, which were assigned to control the Masajid platforms (minbar), universities and private projects, or the secular and national parties, they were all servants and implemented the plans of the British, who committed crimes for 33 years against this country; that its impact remains today. 3- America’s agents, whether the movement of Baum in the south or the militias of the Houthis in the north, their crimes are like their predecessors British agents. They are a tool in America’s hand that participated in fuelling the wars and conflicts and became a party in the war. 4- The warring Kafir West in Yemen, both British and American have derailed the revolution from its course, through its agents and organizations, which spoiled the atmosphere of the revolution with their deadly poison and dragged the country to wars and conflicts. 5- The Kafir West worked to kill the revolution in the hearts of people to end this revolution, as it is a revolution on the capitalist system and its men and crimes against the people of Yemen over decades. 6- The real revolution is based on Islam, which Hizb ut Tahrir has shown. It is not a revolution to change people only, but a revolution that uproots the system from its roots, constitutions, form, and content. 7- The people of Yemen were confused due to the conspiracies on their revolution by the local, regional or international warring parties. People lost hope in change towards the better. The conflicting parties seeking benefit, the non-governmental groups and the deterioration of the situation in the country have increased their desperation and they lost hope in any real change. 8- Hizb ut Tahrir, like “the bare Warner” very keen in warning, showing the people of Yemen what the regime is and how it can be changed, showing them the regime of Islam as an alternative worthy of adoption and implementation. 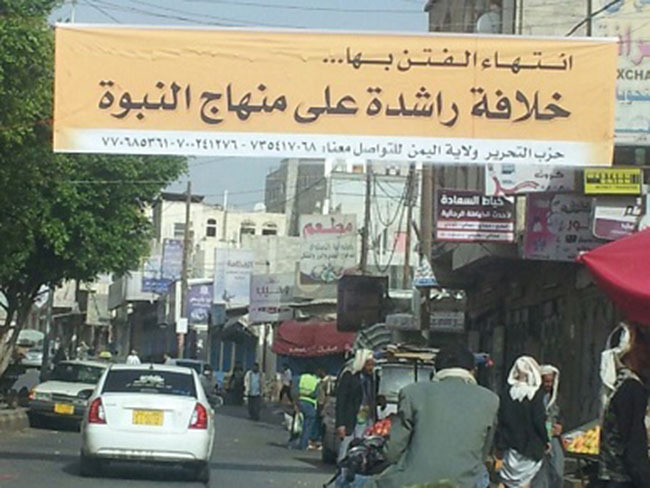 The party warned of the poison spread by the agents, poisoning the revolution’s atmosphere in Yemen. Like the slogans: “Civil state, freedoms, empowerment of women and other malicious secular slogans. The party warned them of the outcome of the national dialogue and the idea of federalism that the people did not demand in their stolen revolution. 9- The people of Yemen today must not be discouraged by the result of their revolution. Rather, they must think in the right way to change their miserable reality. Perhaps Allah’s wisdom wanted the truth to be revealed to them about the agents who fought each other in these years, especially those who raised the slogans of Islam without carrying a project for true change, in which Islam is embodied as a doctrine and a system of life that takes care of people’s affairs in all their affairs. Finally: O our people in Yemen until when will you continue to be the fuel in the cycle of conflicts and wars of these warring criminals? Is it not time for you to leave the superficial absurd thinking, and start to think with the logic of Iman and wisdom and move towards real change on the basis of the great Islam?! Hizb ut Tahrir, is still calling you with honesty and advising you, and by Allah it does not seek money or to rule over you in return, but it demands the rule of Islam on the land by establishing the Khilafah Rashida (rightly guided Caliphate) on the method of Prophethood, in which is your happiness and the pleasure of your Lord. Previous PostHow the Political Life of a Puppet Ruler Ends? !